Before we look into projective geometry, we will first need to state two very simple yet important definitions. Definition: The points $P$, $Q$, and $R$ are said to be Collinear if there exists a line $L$ that passes through all three of these points. 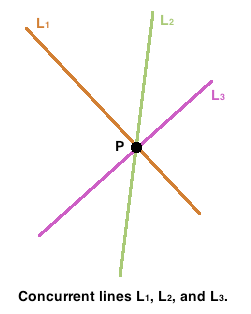 Definition: The lines $L_1$, $L_2$, and $L_3$ are said to be Concurrent if all three of these intersect at a common point $P$.